Now with a crew of only 2, we left Söderhamn at 4 pm and had perfect conditions to sail to the Aland islands, the speed often reached 8 knots and averaged 7.3 knots. After arriving at 7 am, we had breakfast and some sleep, the went for a lunch hike. This produced not only lots of blueberries but also chanterelle mushrooms. Gunnar proved to be a great expert in such delicacies. Later, observing that we were short in bread, he baked an excellent specimen with oats and rosemary fragrance, it matched to perfection the last of the Jura cheeses we still had on board. Hamnholmen to Kökar is one of the more common crossings of the Aland archipelago. This well-marked route passes between an infinite number of small islands, with here and there a holiday house or other discrete sign of human activity. One of the more bizarre constructions is a large jetty in a small village where there is hardly anything to be done, there isn't even a shop, but where ferries stop (mostly at night) when sailing through Aland on their way between Sweden and Finland. The reasons are easy to guess if one considers the autonomy of the Aland islands. The autonomy has also more funny implications, such as the islands having their own Internet domain name. Similarly, visiting sailing boats will generally use a local courtesy flag. On Kökar, we finally have a chance to try the famous Alands Pannkaka of which the recipe stares at us from the logbook, earlier Imram crew must have tried it. This local speciality is a thick pancake made of rice boiled in milk, cooled and mixed with a bit of sugar, some wheat flour, an egg, and most important of all, cardamon. The pancake is baked in the oven and served with jam (plum or raspberry) and whipped cream. Undeniably, something that is not to be missed! Here, at last, we meet some non-Scandinavians: a group of Swiss has rented a boat for sailing in the region and we get the visit of Jean-Michel Nalpowik, designer of the Poussière d'Etoiles series, and two his daughters. And last but not least, although we're no longer in Sweden, we try the Swedish specialty of surströmming ... a tin which looks like it is ready to explode (so much so that some airlines refuse to transport it) with fermenting herring inside. Peter had bought a tin in Ratan, which apparently is famous for this. Prudently, we open the tin outside so as to avoid dousing the cabin with the liquids produced by fermenting fish ... Athough undeniably unusual, the fish actually tastes remarkably good, no similarity with the smell of the liquids emerging from the tin. We leave Kökar in the late afternoon with a serenade played on the trumpet by one of the daughters of Jean-Michel! The zone is not covered by the portfolios we have for the inner routes and we therefore pass via the Gulf of Finland proper. The islands are sparser, but there are all the same outlying shoals at 10 nm from the coast. In the morning, the Bengtskär lighthouse emerges, scene of a fierce battle between Finland and Russia in July 1941, with heavy loss of life. A striking feature is the large building offering accommodation for the staff. This apparently resulted from the custom that the crew stayed there with their complete families, at the peak in total some 40 people, including a schoolteacher. Shortly after, Morgondland appears, probably the morning land for Bengtskär, with its natural bay on NE, it looks almost tropical on this warm summer day. Hanko was a favourite resort of the Russian nobility in the 19th century and this shows in the large number of elegant wooden houses all along the coast. As suggested by the tourist agency, we made a long walk all around the peninsula, which not only takes in the historic parts and the forests, but also the modern harbour where countless cargo ships are unloaded, their cargo, mostly cars, is from here transported to Russia by train. The internal route here uses narrow passages with forests on both sides, and gradually there are more and more holiday houses as we approach Helsinki. We also pass by the former Soviet military base of Porkkala (Porkala in Swedish), returned to Finland only in 1955, and nowadays a Finnish naval base. Good thing that the Imram has little draught, to get to Inkoo the short way, one passes sections with less than 2 m of water (there is also a route with at least 2 m 60). Again mostly via the internal route, but with a longish section in the open sea to take advantage of the wind, a nice 3 Bf but straight in the axis of the internal route. 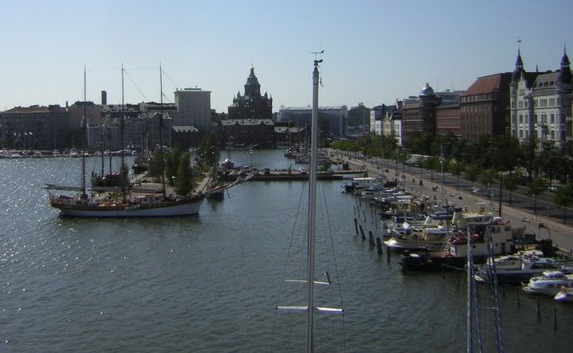 And so we arrive in Helsinki, where we moor in a harbour near Tervasaari (Tjärhomen in Swedish, the name seems to mean "tar island", a reminder of the Teerhofinsel where the boat spent the winter). Fittingly, the leg ends as it started, with the Helsinki ice-breaker fleet moored nearby. We're one day ahead of schedule, which leaves us the time to visit the town while awaiting the arrival of the next crew.